To celebrate Glasgow 2014, Scotland’s pubs and bars are making sure that anyone who visits them will have an extra special Commonwealth Games story to tell. From beer festivals and special Commonwealth themed menus; to cheering on local athletes and even turning their bar into a village to celebrate particular Commonwealth nations – Scotland’s pubs and bars are the ideal place for visitors to experience the authentic warmth of welcome for which the country is renowned. We will showcase some of the great ways our pubs & bars are making sure they’re at the heart of the Glasgow 2014 community on this page. If you’re visiting anywhere in Scotland, our app (which is free to download via iTunes and Google Play) will help you find some of the premises close to you and learn about the fantastic Scottish stories they have to tell. The City Walls located in the historic heart of Stirling will be cheering on local Ross Murdoch (pictured above), one of Team Scotland’s top swimming medal hopefuls and a regular visitor to the bar. 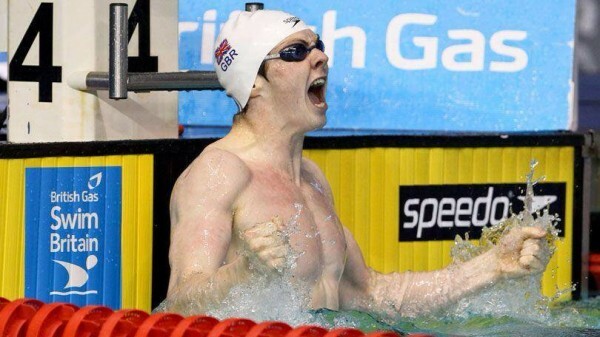 Expect to see some of the great Scottish sporting passion when he’s competing. The City Walls is a big sports pub with 11 HD TVs. A mecca for real ale and over 280 malt whiskies, the Bon Accord in Glasgow will be adding a fourth beer festival to their calendar of events for the duration of the Games. The festival will celebrate all things Scottish, from the beers themselves to the delicious food they serve. They say music is the food of love, and you will certainly get that on some days in the Angels Hotel in Uddingston (near Glasgow). A renowned meeting spot for couples meeting and falling in love, food itself will play a key role during this Commonwealth Games, as they put on a menu showcasing foods of the Commonwealth. One of Glasgow’s finest music venues, Maggie Mays in the city’s Merchant City, will be turning their nightclub into a restaurant for the duration of the Commonwealth Games. And if the adrenalin of the Games keeps you awake, they will be offering a full menu until 2am. To celebrate Glasgow 2014, Jinty McGinty’s in Glasgow’s West End will be serving different beers from around the Commonwealth. And to make sure there is still something to eat after their full menu finishes at 3pm, there will be an outside barbecue provided by the Smoak Food Truck Co, including burgers made with 100% Scottish beef. Aptly for the Commonwealth Games, Jinty’s father Vincent O’Kine, was a well-known boxer from the Maryhill area of Glasgow. Belhaven Pubs are producing a special Commonwealth Games guide to their Glasgow pubs. The Maltman, The Rhoderick Dhu, The Old Schoolhouse and The Scotia Bar will all feature alongside 12 other pubs. Many of the Belhaven pubs will also be screening the Games.